It’s been a little over a week since edcamp Boston 2012 and I still can’t stop smiling about the experience! What an unbelievable day of learning, sharing and collaborating with other passionate educators. If you are an educator and have never been to an edcamp you should try to find one near you soon! It was amazing. As I arrived at the Microsoft NERD (New England Research and Development) Center I really had no idea what to expect. After a bit of free breakfast, coffee and meeting other teachers there was an explanation about the day from the organizers @dancallahan, @tsocko, @ldelia @lizbdavis, @karenjan). 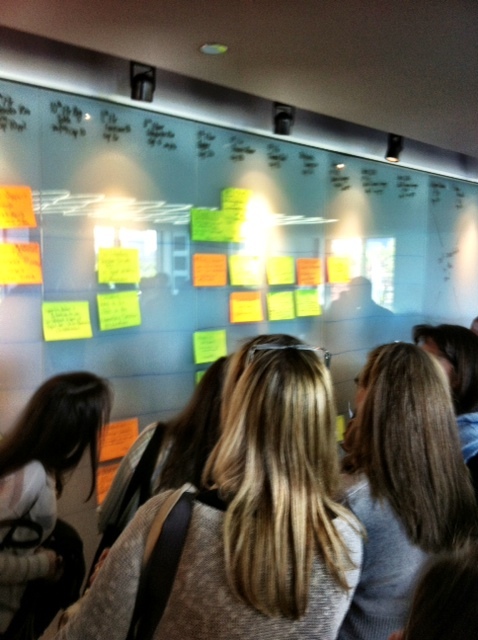 Anyone who knew they wanted to lead a session was asked to go downstairs and put a giant sticky note on the board. The board was filled with room locations and how many people could fit in each room. Within fifteen or twenty minutes most of the day’s sessions were put into a Google doc and the unconference was off and running! Sessions ranged from technology topics such as Twitter, BYOD, and iPads in the classroom to other educational issues like using theater games to teach empathy and Common Core. There was also free lunch and a lot of socializing with teachers from around New England, including meeting lots of people I have followed on Twitter for a while! I loved that the day was driven by the participants. Anyone could lead a session if they were interested in a topic or wanted to learn more about something. As I was looking at the board one person asked if anyone was interested in urban education. It got few positive relies and a session was born. The rule of two feet also ruled the day. If you got to a session and it wasn’t for you, you were encouraged to leave and try another session or even gather in the hallways for very informal conversations with other educators. Another highlight of the day was the smackdown that took place at the end of the day. Everyone in attendance was invited to have two minutes of time in front of everyone to show off something they thought was valuable such as a cool website, app or project. It was a great way to learn a lot of new things in a short amount of time. One of the websites I learned about at the smackdown was Thinglink.com. Check out my Thinglink of edcamp Bostonbelow! Can't wait for my next edcamp!